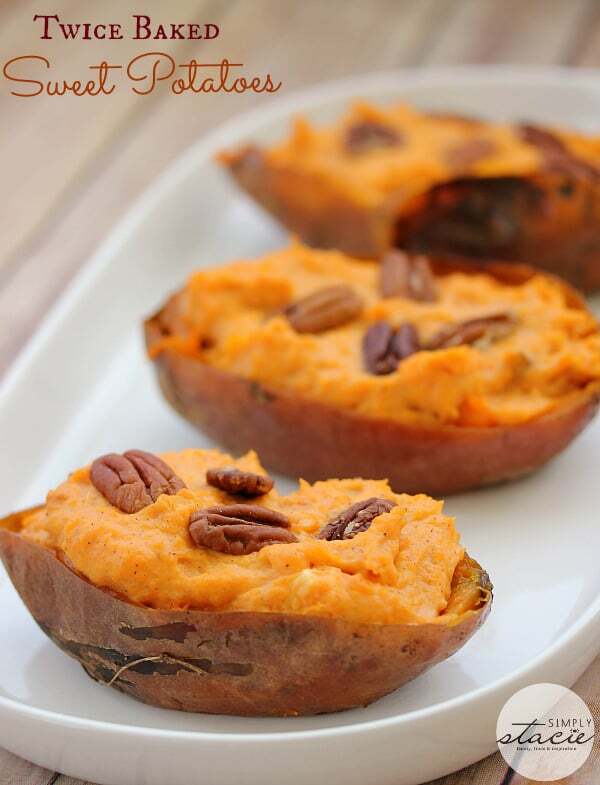 Since National Sweet Potato Month starts in February, some friends and I thought it would be fun to create some recipes using sweet potatoes as the main ingredient. It’s only in recent years that I started eating sweet potatoes. I don’t remember my mom ever making them when I was growing up. Our family loves them including my girls. They are so versatile to cook with. You can bake them, fry them and even use them in desserts! I plan to make a sweet potato cheesecake soon so I’ll be sure to post the recipe on my site once I do. 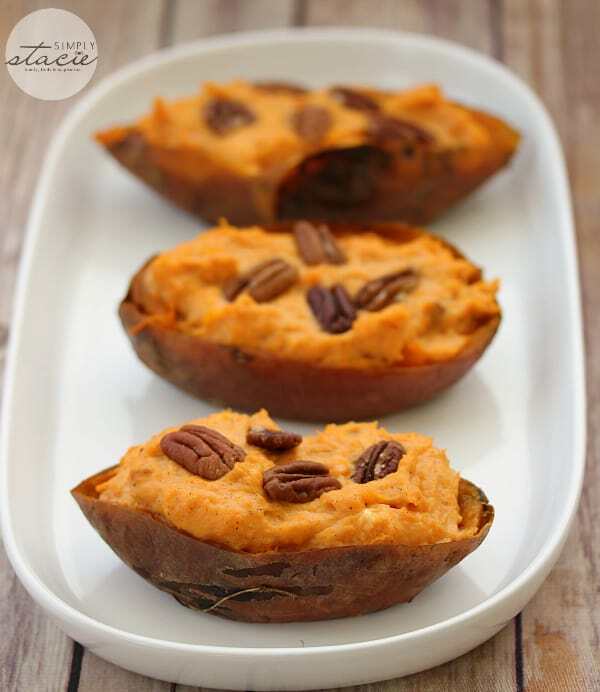 Today I wanted to share this recipe for Twice Baked Sweet Potatoes. They are simple to make and taste amazing. The inside is sweet, creamy and rich. I can usually only eat one at a time since they are so filling! 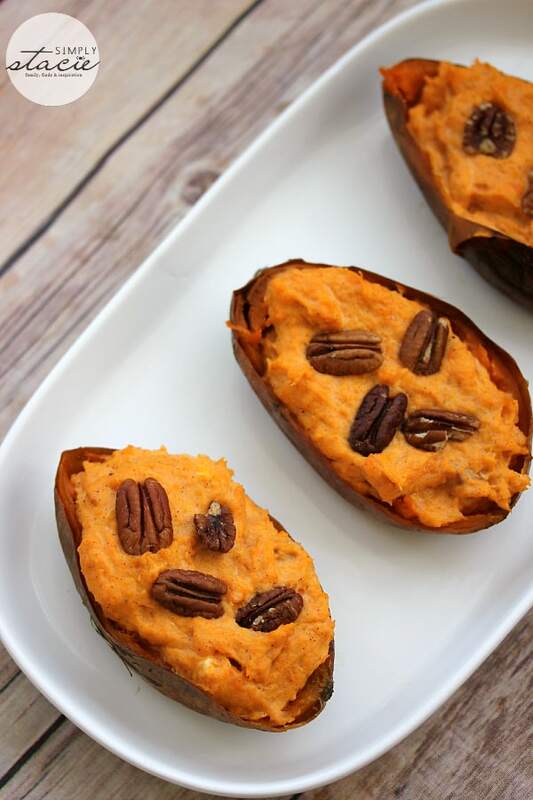 The addition of cream cheese makes them creamy and smooth and they don’t require a lot of extra sweeteners since sweet potatoes are naturally sweet. Some recipes call for brown sugar to be added, but I make mine without sugar and use only maple syrup to sweeten. I only use about 1 tbsp and I think any more they would be too sweet! Add pecans at the top adds a contrast of texture. You might also like these Candied Sweet Potatoes. Creamy and rich made with maple syrup and cream cheese. One of my fave sides! Wrap sweet potatoes in aluminum foil. Bake in a 400°F oven for 1 hour to 1 hour 15 minutes or until potatoes are softened. Let cool for 15 minutes or until you are able to handle them. Unwrap sweet potatoes and cut in half lengthwise. Carefully scoop out the insides into a bowl leaving only a shell with the skin. 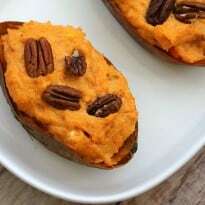 In the bowl with the scooped sweet potatoes, add in cream cheese, cinnamon, nutmeg, maple syrup and vanilla and mash together until blended. Add a few tbsp of the mixture to each potato skin. Top with pecans. 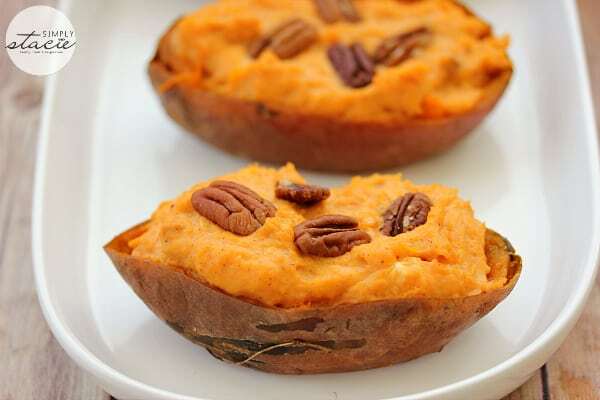 Place sweet potatoes back in a 350°F oven to heat up for about 5 to 7 minutes. Serve hot. Makes 8 individual potatoes. I love sweet potatoes!! I am excited to try this recipe!! These look yummy. I love sweet potatoes. That looks like an amzing recipe! A must try! I live in a sweet potato growing area so we eat them often. I’ve made twice baked, but never with cream cheese–love that idea! Thank you for linking up, Stacie. Hi Stacie – these look so good! I just want to let you know that I included it in my List of Fabulous Finds on my blog today … today’s finds are links to recipes for a completely fabulous Thanksgiving feast. I can’t wait to serve this!